Hose month Honda Sonic 150R launch in Jakarta, now is the time for us to discuss more about the differences with the main rivals, Suzuki Satria FU. Equally compete in the same segment, Underbone (duck) class 150 cc, with the design of a rooster. 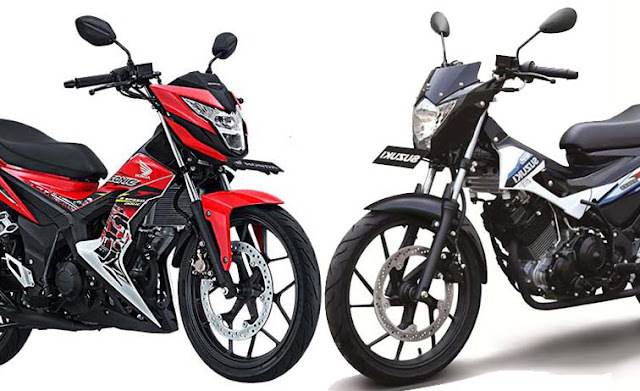 In the visible, Satria and Sonic look similar, but different enough siginfikan if considered more carefully. Consider the following discussion! If you look at the technical data of both a sole agent of Honda and Suzuki, the second dimension Sonic and Satria FU figures are not much different. Satria has a length of 1,945 mm and a width of 652 mm, while Sonic length 1,941 mm and a width of 669 mm. Satria longer 4 mm, while Sonic wider 28 mm. Both models also have a similar design, but the differences begin to be felt from the design of each ornament. Uta lamp for example, Sonic design looks more assertive and sharp, is equipped with luminous white LED lighting systems. While Satria itself has a softer shape of the headlamps in combination with sharp lines and a slight arch in the "crest", and still maintain a halogen lamp with yellow lighting. Shape of the seat is also distinctly different, Satria has a seat that is slightly slimmer with sloping grooves between the passenger and the driver's seat. While Sonic is equipped with wider seats and with a character line arches. Both rooster engine equipped with a 4-valve DOHC (Double Over Head Chamshaft) with a six-speed, both have differences from the fuel intake technology. Satria carburetor while Sonic has been injection. Although still carburetors, Satria qualify for Euro III emission, with little change in the device perform muffler (exhaust). Both motorcycles are equally equipped with Safety Shutter Key to provide security on a motorcycle. For the convenience of driving and anticipate leakage current tire on the way, both products are equipped with tubeless tires. Brake disc brake system for front and rear tires, also owned by Sonic and Satria, which makes braking becomes more leverage. New Sonic indicator panel has been entirely digital, the information provided is complete, such as real-time fuel gauge, speedometer, position information transmission, and tachometers. While Suzuki Satria only tachometers are still analog, digital rest. However, Knight did not have information about the position of the transmission. Both do have a look that is not much different, and there are advantages and disadvantages in each of its features. Sonic offers something more fresh, Satria has a simple design but still acceptable to consumers.